Last British engineless square rigger to trade foreign. Available as a signed numbered limited edition print, from £147. 40 x 61 cm (16″ x 24″), available £1,100 ex studio, ex frame, and as a signed numbered limited edition print. Pictures can by arrangement with us be purchased in easy payment stages bank to bank or via PayPal. 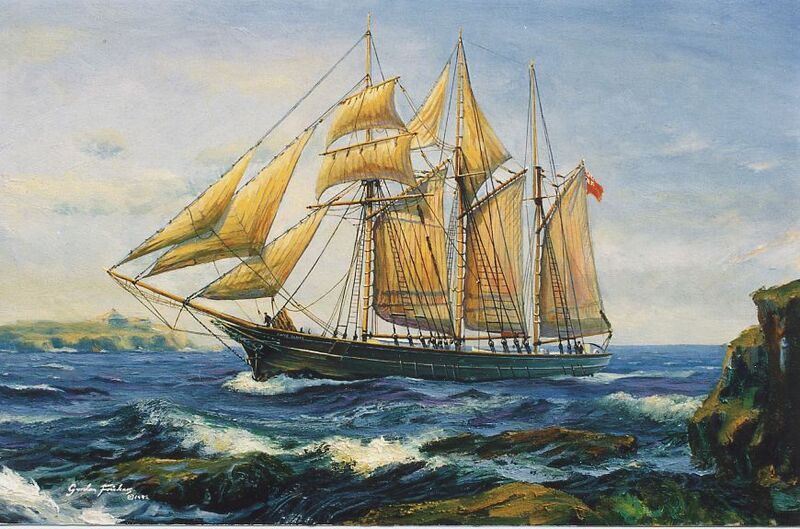 The schooner “ Jane Banks “, running mate of the famous ‘Waterwitch‘ of Fowey, sailed into history as the last pure sailing British square rigger to trade abroad and the engineless last topsail schooner to operate from a British Port, Fowey in Cornwall. A limited number of ‘Heritage’ quality copies of this “Jane Banks” are available as a signed by the artist, me, Gordon Frickers, priced from £147.00, don’t hesitate to ask for details. The first copy was ordered as a gift for the mother of a descendant of a former Jane Banks Captain, Rundle. Ex “ Frau Minna Peterson “, the ship was renamed “ Jane Banks ” after Edward Stephens’s mother. “ Jane Banks ” went into the China Clay trade sailing mostly from Cornwall to the Mersey with clay and returning with coal, occasionally to the Humber or the Tyne.